A Sense of Urgency – Do you Have it? This is my third John Kotter book to read, and I’ve become quite a fan of his work. I was first introduced to John Kotter through his previous books Buy-In and Our Iceberg is Melting. Kotter is Konosuke Matsushita Professor of Leadership, Emeritus, at Harvard Business School and is widely regarded as the world’s foremost authority on leadership and change. If you serve on a church staff, lead a group of people (Bible study), are employed by a secular company, or perhaps own your own business, A Sense of Urgency is a must read. Kotter recognizes the biggest problem facing organizations is a sense of complacency. Kotter states that, “…complacency is much more common than we think and very often invisible to the people involved” (p.ix). Complacency leads to passivity on the part of leaders and employees, and often proves fatal to their business. Competitors rise, the market changes, and complacent organizations find themselves in serious trouble, wondering what happened to their share of the market. Even worse, they find themselves out of business. Category 1: People dramatically bring outside reality into groups that are too inwardly focused. Effective leaders do not do an “information dump” about the external realities their organization is facing. Instead, they carefully craft emotionally compelling presentations utilizing other people, information and business cases. There is an appeal to the heart, not just the head. Category 2: Leaders behave with a true sense of urgency themselves every single day. Leaders who have a sense of real urgency about the future of their group or organization act on those beliefs every time they interact with people, every single day. They begin and end meetings on time. They follow up quickly on action items from those meetings. They send e-mails that update their employees about the state of the competition their organization faces. Category 3: They look for the upside possibilities in times of crisis, but act on them with great care. Leaders do not only see a crisis as a threat to the organization, but they have a knack for finding the opportunity that advances the organization’s interests. Category 4: They confront the problem of “NoNos” and do so effectively. These leaders do not accept that naysayers have to be put up with in the organization. People who relentlessly create experiences that kill urgency, who’s reaction to new ideas is typically “No, no, you see…” are dealt with and neutralized using one of several strategies. 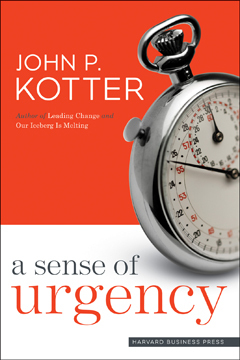 If you believe that the time for your group and/or organization is to act now, not later, and you want to instill a real sense of urgency among the people, Kotter’s book is one you should order this week. Churches can become complacent. Sunday School classes can become complacent. The business for which you work can become complacent. And when complacency becomes the norm and not the exception, you won’t have a viable organization for very long. The time to act is now. No more complacency on your part. To read more about A Sense of Urgency, click here to go to amazon.com and the landing page for Kotter’s book. If this sounds like something you’d benefit from reading, also consider reading another of my favorite new books, Disrupt. You can follow the link on the right sidebar menu of my blog (Books I Recommend) to read more about its contents. These two books together would be a powerful combination of resources that any leader should have in his or her personal library. Tomorrow’s blog post is a teaching tip for group leaders. Don’t miss out on a single post! Sign up today at my home page and begin receiving daily encouragement and equipping to be a better group leader, or a better church staff leader who is responsible for an entire groups ministry!